United legend Gary Neville has helped pay for a giant flag honouring the victims of the Munich Air Disaster. The Sky TV pundit and England coach has helped fund the banner, which features the Busby Babes as they lined-up for the final time before the 1958 tragedy. 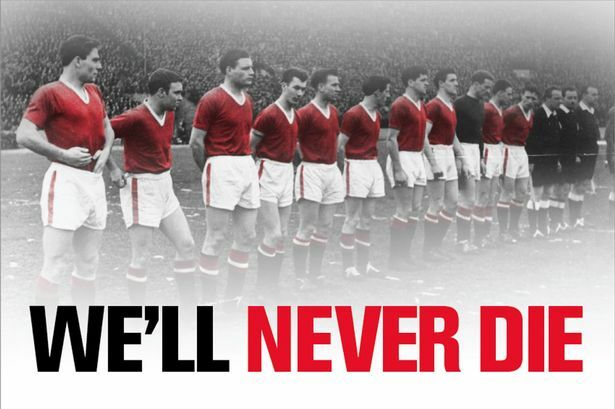 It will be unveiled in the Stretford End to mark the 55th anniversary of the disaster, in which 23 players and officials died. Fans’ group Stretford End Flags (SEF), asked supporters for their ideas of a theme for the flag. But Neville stepped in to suggest the Munich Disaster theme, revealing that the image was used by Sir Alex Ferguson to inspire his men. A shortlist of six designs were sent to Neville. He plumped for a black and white image – with the players’ red shirts and white shorts in colour – taken before their ill-fated European Cup clash with Red Star Belgrade. Underneath it the message, taken from a terrace chant, reads: ‘We’ll Never Die’. The flag, which is 30m high and 47m wide, will be one of the biggest ever seen in Britain and will cover most of the lower tier of the Stretford End. It will be unveiled before United’s game with Everton on February 10 – four days after the Munich anniversary. Neville’s contribution will be added to funds from the club and SEF. A spokesman for the group said: “Gary saw one of our Tweets and got in touch. He said that if it was something to do with the Busby Babes he would get involved. “Gary told us it was used to motivate the players and they knew all about what the image represented.” He said the fans’ group still needed contributions to make sure they met their third of the price.